South Jakarta Mayor, Marullah Matali leads South Jakarta Communal Work (BBJS) in Pondok Labu Market, Cilandak, South Jakarta.
" 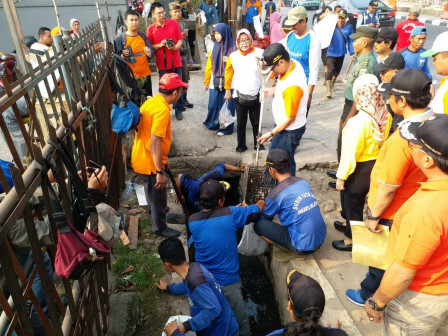 We also dredge mud in the water channel of Jalan Pasar Pondok Labu"
He stated it is routinely held to educate the public to participate in maintaining the cleanliness of the environment. Not only cleanliness, it is also done arrangement of parking lot and street vendors (PKL) around the market. "We also dredge mud in the water channel of Jalan Pasar Pondok Labu," he expressed, Sunday (7/22). The activity itself involves hundreds of officers under Water Resources Sub-dept., Bina Marga Sub-Dept., Environment Sub-dept., PPSU, army, police and locals. "We involve all components in sub-districts, urban villages, and RT/RW," he told. He also helps them to clean the channel from garbage and mud to minimize inundation when it rains.